The “Twelve Treasures of the Kingdom of Spain” was a contest/poll that was conducted by the Spanish Television Company Antena 3 and the radio broadcaster Cope. The final results were announced on 31st December 2007. I thought it might be interesting to take a look at the eight out of the twelve that I have visited and having completed that I thought I might come up with a personal alternative twelve. 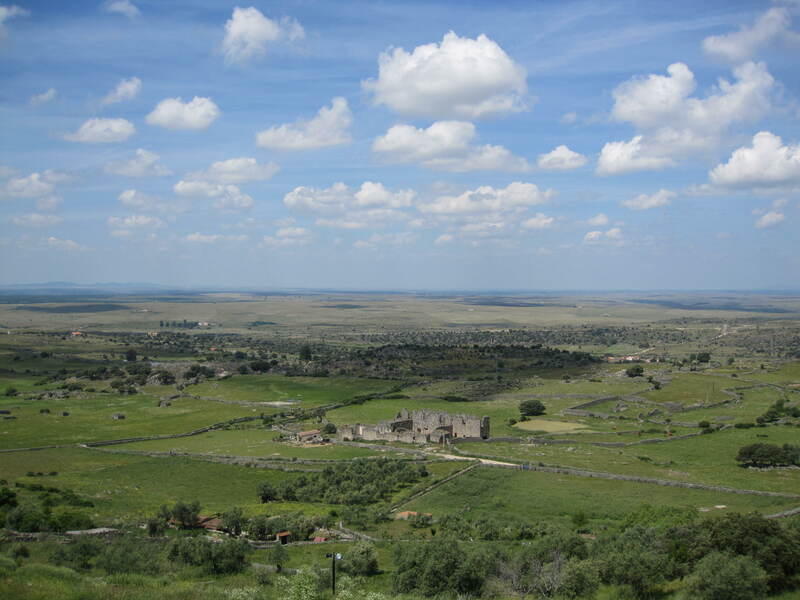 In the hilltop town above the sunburnt plain there stands a statue of a man who changed the course of history – Francisco Pizarro the illegitimate son of a Castilian soldier who, five hundred years ago, left his home to seek his fortune in the New World. With fewer than two hundred troops and a few dozen dogs and horses, he conquered the vast empire of the Incas and the Spanish colonisation of South America had begun. 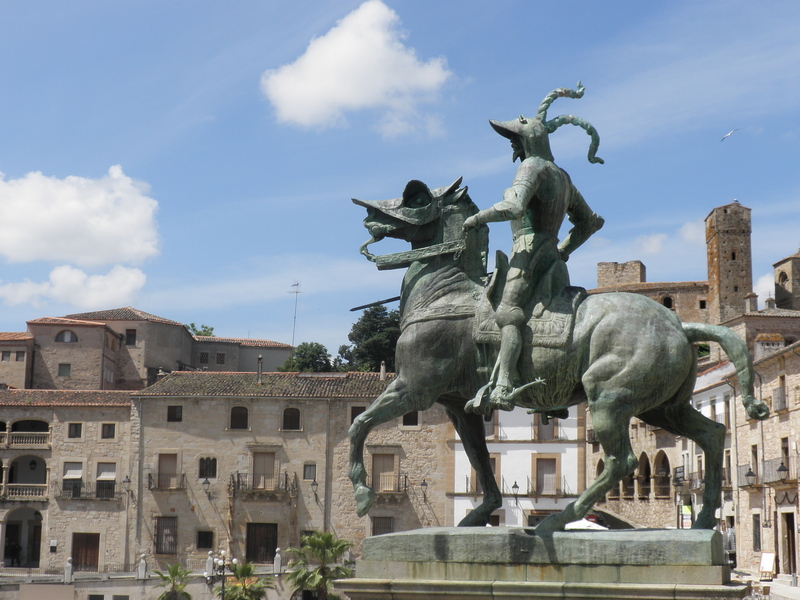 It is a magnificent statue, matched only by that of El Cid in Burgos, and I challenge anyone not to admire it. 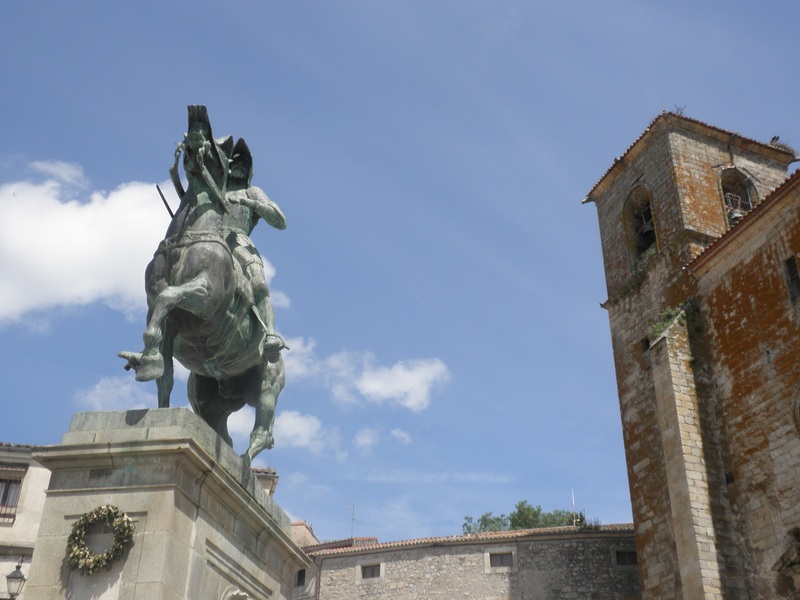 Here is the gigantic figure of Pizarro astride his proud giant of a horse dominating the entire square of Trujillo, head up, beard jutting and helmet plumes flowing as though trying to stay attached to his helmet whilst at full gallop. The statue captures and epitomises the flare and the audacity of the conquistadores and in his hand he carries a menacing sword but in a message that here was a man who lived and died by the sword the statue has no scabbard which seems to suggest that he rarely ever put the blade away! Trujillo is a city on the Tozo River, a tributary of the Tagus and is sited on the only hill for miles around about forty kilometres east of Cáceres. Although the Autovia passes close by it is not an especially busy tourist city so when we drove in and followed signs to the Plaza Mayor we found parking unexpectedly easy just a few metres away from the main square. The pace of life in the plaza was delightfully slow with a just a few visitors wandering around and others sitting with local people in the bars and cafés around the perimeter. It was pleasantly warm but I would suspect that in high summer this large exposed granite space can become the Sun’s anvil and it would be important to find a spot in the shade. Trujillo has apparntly always been a tough old place. “Its inhabitants normally survive on pillage and trickery…” wrote El Idrisi, an Arab traveller, in the fourteenth century – and pillage and trickery were what the Conquistadors did best. They sent back shiploads of plundered gold and filled their home town with elaborate mansions. All around the square there are grand palaces and mansions and outside the sixteenth century Iglesia de San Martín in the north-east corner is the reason why, a great equestrian statue of the famous Spanish conquistador. It is an interesting coincidence that many of the sixteenth century explorers and adventurers who carved out the Spanish Empire in South America came from Extremadura and as well as Pizzaro, Hérnan Cortés, who defeated the Aztecs and founded Mexico, Hernando De Soto, who explored Florida, and Pedro de Almagro, who accompanied Pizzaro, all came from this south-west corner of Spain. 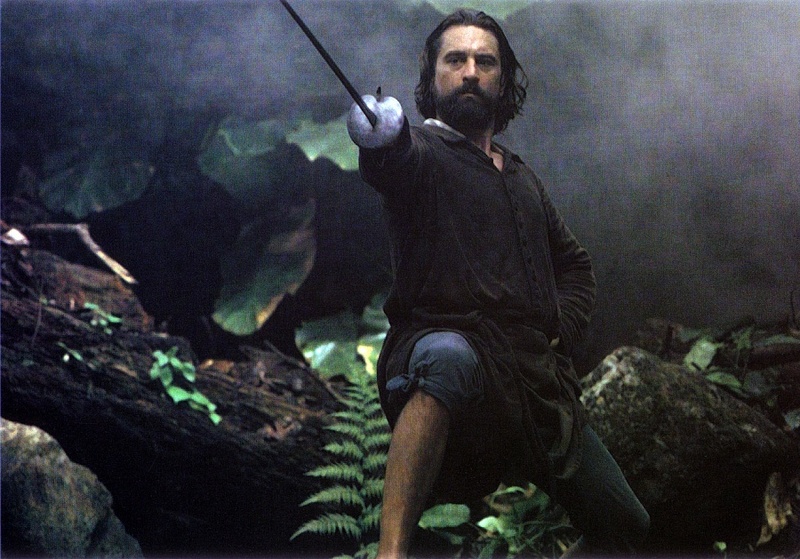 Francisco Pizzaro was born in Trujillo and became a conquistador who travelled along much of the Pacific coast of South America. I imagine he wasn’t an especially pleasant man – with an army of only one hundred and eighty men and less than thirty horses he encountered the ancient Incan empire and brutally and quickly conquered it, killing thousands of natives, including the Inca King Atahualpa and stealing immense hoards of gold, silver, and other treasures for the King of Spain and for himself including the Inca King’s wife who he took for a mistress. As a consequence of Pizzaro’s adventures, Spain became the greatest, richest and most powerful country in the world at the time and as well as conquering Peru and founding the city of Lima, he also added Ecuador and Columbia to the Spanish Empire thus providing immense new territories and influence and spreading Roman Catholicism to the New World. We walked out the Plaza Mayor and followed the steep cobbled lanes as they twisted their sinuous way up past buildings constructed of attractive mellow stone, past the inevitable Parador and more churches and mansions until finally we were at the top at the Alcázar of the Moors who controlled this city for five hundred years before the Reconquista. Inside the castle we walked around the high stone walls glinting in the sunshine and stopped frequently to admire the uninterrupted views over the sun-baked dehesa of Extremadura spreading endlessly in every direction in a ragged patchwork of agricultural green, gold and brown where distant villages float on the vastness all the way to Portugal and stunted oaks and olive trees provide the only cover in a harsh terrain. But although it sounds bleak, this dramatic landscape has a barren beauty. Far from the crowded beach resorts, this is Spain’s unspoilt heartland. Walking back down to the plaza was a great deal easier than the energy sapping climb but we got lost in the cobweb of tiny streets and surprised ourselves by emerging at an unexpected entrance to the square which was jam-packed with cars on account of it being the end of school for the day and parents were collecting their children to take them home. It was a little past lunch time and we were overdue something to eat so we examined the menus at the pavement restaurants and when Kim was satisfied with our choice we found a seat in the sun and ordered some local dishes and a glass of beer. As the Plaza slowly emptied and peace and quiet was restored it was nice sitting in the sunshine enjoying the sights of the square in a city blessed with great architecture and a theatrical history but mercifully not overrun with tourists. It was lovely and if I was planning the trip again I am certain that I would squeeze at least an overnight stop in Trujillo into the itinerary and we would have stayed longer this afternoon but we had a long drive ahead of about two-hundred and fifty kilometres because now it was time to start to drive back east towards Castilla-La Mancha which was going to be about a three hour drive. This entry was posted in Europe, Food, History, Natural Environment, Spain, Travel, World Heritage and tagged Extremadura, Francesco Pizzaro, Hérnan Cortés, Photography, Spanish Empire, Travel, Trujillo. Bookmark the permalink. The current Spanish downturn is likely to be just a glitch and they’ll soon be back to pillage and trickery and plundering gold, at least on the football field. Thanks Richard, I am sure you are right – and currently top of their qualifying group! Sounds like an interesting place. I can’t help thinking that so many of them became adventurers to escape this bit of the world, Andrew. The heat must be intolerable in high summer. Good time to go a-swashbuckling! I’m sure there is some truth in that Jo! Thanks for reading and the comment. Interesting place, Andrew. I can’t help but wonder if many of these people had “such itchy feet” that they would brave the unfamiliar oceans for the adventure. I guess there was no TV, no theater, not a lot of sports, and traveling to other European countries was not as convenient. What’s an energetic young-un to do, huh? Every post you write makes me want to be there. You have such a knack for making destinations come alive in the mind. In far away Perth, Western Australia it is a luxury to sit with a coffee and enjoy your wonderful journeys. Thanks!